As I’ve noted before, the Discord channel for your class is a great place to get information about how to play your class and spec well. I recently checked the https://www.reddit.com/r/competitivewow Discord channel list, and wanted to post a list of class channels here as well for your reference. If you want to make sure that guide you read in prepatch is still up-to-date and search for more resources, the Discord channel for your spec is a great first stop. I will be going through and cultivating the class guides, hopefully in time for the release of mythic raiding. In the meantime, your class Discord is a good first place to check for up-to-date information, and can be all you need in some cases. For even more Discord channels, check out this list on Reddit: https://www.reddit.com/r/wow/comments/4yfgms/wowclass_discord_info/. This guide will outline some items to focus on in Suramar to maximize the Nightfallen reputation gains and overall success you have at Withered Army Training. This is not an all-inclusive guide, and will reference other resources on Withered Training that you should check out before starting the training. I wrote this guide because while there are a few great guides on how to clear the scenario, it was harder to find detailed information on how to prepare for the scenario or what to do your first few times. What is Withered Army Training? Withered Army Training is an every-three-days world quest that grants reputation with the Nightfallen, Artifact Power, and other goodies. You must complete about 40 quests in the Suramar storyline, ending with Building an Army!. I heard I have to pay Ancient Mana to do the scenario? The first time is free, after that you purchase troops with Ancient Mana. You can enter the scenario the second time right after you do it the first time, by the way. After that, you have to wait about three days in between attempts. How am I graded on Withered Training? The more mobs you kill, the higher your score. What score do I need for maximum reward? If you get 375 score, you maximize your +425 reputation reward, with other breakpoints at lower scores. A Withered soldier is running away – what do I do? Run to it and right click on it. I want to be a hero and kill all the bosses I can and defeat the training. Will I be rewarded for this? The further you get in the scenario, the more access you have to rewards. Wait, I thought rewards were based on score? You get certain rewards for getting 375 score or above. For others, you have to give up your Withered to carry back chests of rewards, so only complete them after you have gone as far as you want to on that attempt! These rewards cost either 5 or 10 Withered, and are either external to the training or upgrade your army for the next time you do the training. Most rewards that do not upgrade your army are cosmetic. How else can I maximize my reputation with the Nightfallen? Hey! This is a Withered Training guide, stay on topic. But, to answer, do every world quest in Suramar you see, do the three daily turn-ins to your Shal’Aran Withered, and complete all the story-line quests in Suramar. In order to prepare for Withered Training, it may be useful to travel quickly around Suramar by unlocking portals. Unlocking all the portals will get the achievement Now You’re Thinking With Portals. See the comments there for some suggestions on unlocking the portals. I recommend the Handynotes addon and the Suramar Telemancy module that shows these portals on your map. The higher cap to your Ancient Mana pool you have, the more Withered you can start out with in Withered Training. Starting out with more makes the training easier, so you want to get as high a cap as you can. I recommend at least 1300 for 15 Withered, and the maximum cap of 2000 is ideal. Reaching that cap will give the achievement Why Can’t I Hold All This Mana? Once you have a high enough cap (ideally at least 1300), you need to fill it. If you are having problems I recommend three areas to farm for Ancient Mana items. 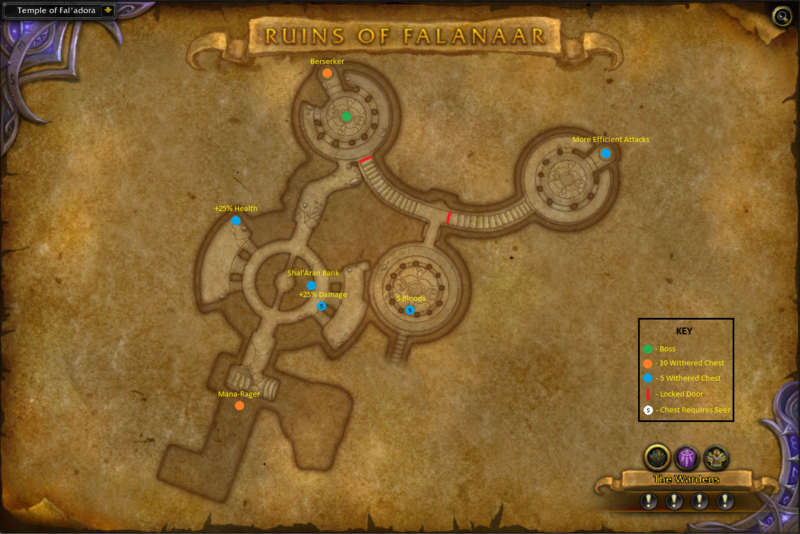 They are at the Vineyard and the Market in Suramar, and the underground Falanar ruins (which Withered Army Training scenario uses the same map as). The Vineyard is probably the most abundant source of Ancient Mana if you face no competition from other players there. If you have limitless gold and no time, you can search on the auction house and pay gold for an Ancient Mana Gem or Ancient Mana Crystal. Before you start the scenario, I recommend looking at three resources. First, the top comment on wowhead here: http://www.wowhead.com/quest=43943/withered-army-training#comments which links to this “Wowhead map.” This resource goes into detail about how to fight each mob in the scenario, so I will not be covering that here. A third resource, this comment on MMO-Champion, includes the “MMO-Champion map part 1” and “MMO-Champion map part 2.” This guide is warrior specific, and had many of the same thoughts I did. You have all expansion to revisit Withered Training and complete it. With that in mind, I suggest you focus on getting 375 score each time until you build up your army a bit. Maximize the reward chests you grab before starting any hard bosses. Kill as many easy enemies as you can, then grab all the upgrades you can from the easy areas. If you complete the easy areas I outline, have 375 score, and have some chests you can grab, grab them, and do the harder bosses next time. If you have 1-4 Withered left over, there is no harm trying a boss to see what the encounter is like; just get the rewards first! Focus on upgrading your army and getting 375 score the first few times you enter the training, not on completing the scenario. Only go into the harder bosses if you have 375 score and there are no chests you can grab. This is not a sprint. There is no reward for going fast, and you can only do the scenario once every few days. Take your time and do not lose Withered to silly mistakes. Use a tank if possible. If not, use a DPS spec with good creature control, prioritizing short cooldown stuns and interrupts. You can hit your extra action button to enrage your Withered. They will aggro everything in sight and do more damage. I recommend using this only when a room is clear and you are engaging a boss. Other than that, it is too easy for things to get out of control with enraged Withered. Get the three daily buffs from your Shal’Aran Withered before starting if you have the Ancient Mana to do so – they will be active in the scenario! 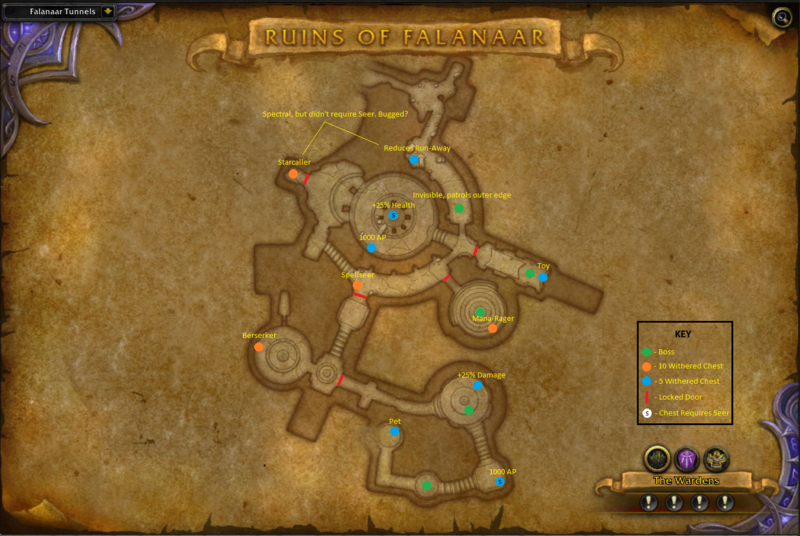 You can get 375 score with the following route on the Wowhead map above. I suggest clearing this route and grabbing the Withered army upgrade rewards from it before trying any more difficult rooms. After 2-4 successful clears of this route, you can do this route and continue on to harder bosses with your Withered army. Then, if you wipe, at least you won’t have missed getting rewards or upgrades, and you can try again at full strength next time. For each room, pull as few mobs as you can at a time and clear them before engaging more mobs. Be careful and hug the walls, as your Withered will accidentally aggro enemies if they get too close. Clear room 1. Head to room 4 and clear it. Clear the area between 4 and the intersection between 5 and 6. A very hard boss, Leystalker Dro, will likely pop out at one of these mobs (he can be avoided with very precise play – see below). Be alert, and good luck! Your very first time, when you start with only 8 Withered, you may want to grab the Health Increase chest (unless you think you can skip Dro – see below), since if you do not have good stuns you can easily wipe to him without getting any chest reward. Be on alert until you have killed Dro, as he can spawn at any mob in room 5. Clear the area between 5 and 8, and clear room 8. Clear the hallway towards 9, and get the one Withered just within 9 if it will bring you to a multiple of 5 for chests. You should be over 375 score, and can turn in your Withered for chests rewards along this path. Make sure to kill every single mob to improve your score. Especially make sure to free the mobs trapped in webs, as some of those hide Withered you can recruit. Along the above suggested route, you can pick up about 16 Withered reinforcements. A good goal is ending with 15 or 20 Withered toal so you can grab two reward chests. Even if almost all your original Withered die at Leystalker Dro, you can recover along the rest of the route. There are a few more Withered inside boss rooms that you can grab if you are very careful about not pulling the boss. These Withered are generally not necessary to maximize reputation gains or chest rewards, so I recommend skipping them your first few times if you are unsure whether you can avoid pulling the bosses. This nifty weakaura by alcaras will display how many Withered are in your army and their average health. It’s a nice way to see whether you are at a multiple of 5 for chest rewards. Especially once you have all the “easy” chest rewards and are progressing further into the instance, the indicator is a good way to help decide whether you can push a bit more or should stop and get the rewards available now. Demon hunters can scan for Dro and avoid him; other classes can avoid him if they memorize his stationary spawn locations (shown in the video) and play extremely precisely. As a tank with several upgrade chests under my belt, I will probably not alter my play now, but for someone new to the scenario, you may wish to try avoiding Dro. Apparently, your Withered will never attack until you do, you can use this to very carefully face pull and fight mobs in safer locations. If you are sure you will not accidentally face pull too many mobs, you can open boss doors and grab a few mobs and/or Withered near the entrance of the room this way. Some players, and the video creator, use the tactic of enraging their Withered in an empty area, then moving ahead and face pulling, then un-enraging their Withered. This is a hack to get the Withered to stop following you for a bit. Be warned, if you stray too far, the Withered will wander off and/or start following you. I had tried this tactic and found it to be fairly difficult for not a lot of reward, but some folks love it and get great results with it. 2017-1-12: Removed references to unlocking dungeons, as The Arcway and Court of Stars are unlocked by default as of patch 7.1. If you follow the above advice, hopefully you will clear the Withered Army training with 375+ score several times. Get three upgraded Withered and upgrade your whole army to have more health and be resistant to fear. Once that is completed, you can clear this route and take on the harder bosses for more upgrades and fun. Good luck! These are two World of Warcraft tidbits I wanted to share. They will help you mount up and clear mythic dungeons each week. EDIT 2016-10-11: Follow up post here. The following is my Mount Up macro. I assign the “favorite mounts” icon to it, and enjoy using it to get around in Legion. Here’s what it does: If mounted, I dismount. If I am holding alt, cast either Azure Water Stider or Crimson Water Strider. If I am holding shift, cast my Yak for repairs and transmog. If I am holding control, cast MekGineer’s Chopper for a two-person ground mount. If none of the above, make sure I am not in bear or cat form (if you skip this step, the next doesn’t work), and summon a random favorite mount. This allows me to set both ground and flying mounts as my favorite mounts for use in the Broken Isles, cast a water-walker/shop/transmog mount/2-seater if I need it, and cast a 2-seater flying mount if I happen to be in a flyable zone. This macro would work for a non-druid. It would cast Crimson Water Strider with alt, Traveler’s Tundra Mammoth with shift, and Sandstone Drake with control for a two-person flying or ground mount. If none of the above, and in a flying zone, cast either Red Flying Cloud or Black Drake. If not in a flying zone, cast a favorite mount. You can obviously change the mount names if you have different mounts or preferences. Happy trails! This weakaura, by Spinalcrack, the first of his name, Co-GM of <Dinosaur Cowboys> on US-Sargeras, Assistant Administrator at www.howtopriest.com, and Protector of the Realm, displays which mythic dungeons you have yet to complete each week when you open up the dungeon journal. There’s a picture of exactly how it looks at the wago.io page. This is deceptively useful! I had thought checking my calendar, figuring out which ones I had done, and subtracting would be just as easy. It’s not even close. Just opening the journal and seeing which mythics I have not finished yet is amazing. Hopefully this helps you wrap up the last few you need to do this weekend. I resisted installing this weakaura for a week even though Spinal is the co-GM of my guild and suggested it to us. Once you install it, it feels like it should have always been there and you never want to go back. That’s pretty much the universal opinion of everyone I’ve gotten to try it. With a new expansion came new addon needs. I started using these three addons (and one phone app) in World of Warcraft: Legion, and they have made pre-raid gearing much smoother. Bobsatchels: The prior addons I had used for finding heroic dungeon satchels did not work in Legion. The humbly named Bobsatchels gets the job done. It has a slick user interface, exactly the options you would want, and most importantly, it works. If you want to be alerted when bonus reward dungeons pop up, this is the addon for you. As an aside, bonus reward dungeons are available almost constantly for tanks and healers right now. For the moment, I turned the notification off because I could play all evening running heroics for bonus satchels, and I have world quests and mythic dungeons to do! Kaliel’s Tracker: I was annoyed how the progress bar for world quests displayed inconsistently with the default UI, often hiding if I was tracking “too many” other quests. Not wanting to untrack my quests, I went to Reddit asking for a solution. This addon does the job and then some. It can filter quests based on the zone you are in, modify the height and font of the quest tracker, and more. It’s hard to describe how well it does the job of tracking quests, but it excels at that task in a “where have you been all these years?” sort of way. World Quester: This aptly named addon creates a sort-able list of world quests. You can sort by time remaining, reward type, newest, and more. There are a few other world quest tracker addons that I tried, and this one worked the best for me. I didn’t need the map changed – I thought Blizzard did that quite well. I needed the ability to sort the quests and determine which to prioritize, which World Quester handles. Edit 2016-9-26: The following is no longer relevant; the original developer gave control of the project to a new developer and regular updates continue. Note: a “Version 2” by a different developer may be arriving soon, as the original developer has not updated the addon or replied to messages for several days. Check the Curse page for a LUA file upgrade that adds tooltips in the meantime! If you want a more organized world map, you can check out World Quest Tracker. I like World Quester and think that Blizzard’s icons on the world map are just fine, but many of my friends love having Tracker in addition to, or instead of, World Quester. WoW Legion Companion App (App Store) (Google Play): I would be shocked if someone learned about this one here first, but I do want to put in a word for this app. It works very well and lets you do exactly what the above title suggests. If you have heard about it but are on the fence about giving it a try, I give it two thumbs up! Note: some users recommend force-closing the app when you are done with it, as it can be a battery hog if left running in the background. Your mileage may vary. I hope these addons make your life in the Broken Isles a bit easier. If you want to check out other useful addons, my prior posts under the User Interface Category have a bundle. Are there any other addons you’ve grown fond of in Legion? Leave a comment and let me know! Now, if a player had to be extremely talented at PvP to get good gear, a mythic raider who was not excellent at PvP might be fine ignoring PvP in Legion. However, this appears not to be the case: you can basically acquire PvP gear from world quests much like how you get other gear from world quests. Here is a list of PvP world quests in Legion. Three Warden Tower Assault quests spawn every three hours, one in each of Val’sharah, Highmountain, and Stormheim. These quests are very straightforward, players must kill several opposing faction NPCs then kill a boss NPC at the top of a tower. The mobs are a bit punishing, so pull a few at a time, bring a tank, wait for other members of your faction to show up, or all three. Doing these quests rewards honor. They also reward either gold, artifact knowledge, or iLvL 805 gear. Here’s the important part for gearing up: These quests, under certain conditions, start rewarding 840 gear instead of 805 gear, the same iLvL gear that drops from mythic dungeons! And just like mythic dungeons, that gear can roll warforged. It’s not clear exactly what breakpoints cause the quests to start spawning 840 gear or stop spawning 805 gear (840 gear starts showing up as a reward at around honor level 14), but as noted by World of Warcraft’s Lead PvP Designer the “gear reward ilvl from PvP world quest increase based on Honor level.” How can you increase your honor level if you don’t want to fight other players in PvP? That’s right, you guessed it, by doing these world quests every few hours. Two notes: First, for the Val’sharah quest, the world map icon currently always directs you to the southern tower. If you get there, and the tower is guarded by your faction, you need to go to the northern tower. It’s located northwest of Blackrock Hold at around (33, 44).